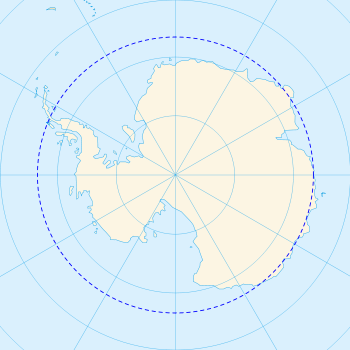 THE ANTARCTIC CIRCLE is an imaginary line located at 66.5 degrees south latitude or 23.5 degrees northward of the South Pole. It marks the southernmost location where the sun can be seen on June 22 (the Southern Hemisphere’s winter solstice) and the northernmost location where the midnight sun is visible on December 21 (the Southern Hemisphere’s summer solstice). On June 22 and again on December 21, the circle of illumination, formed by the sun’s rays striking the Earth, extends from the edge of the Antarctic Circle in the south to the ARCTIC CIRCLE in the north. On June 22, the area within the Antarctic Circle experiences 24 hours of darkness and on December 21 it receives 24 hours of sunlight. The name Antarctic comes from the Greek arktos, or “bear,” in reference to the area’s position below the Great Bear constellation (Ursa Major). British naval captain James Cook was the first to cross the Antarctic Circle in 1773. Exploration of the region within the Antarctic Circle resumed in 1820 when the explorer Fabian Gottlieb von Bellingshausen received support from Russian Tzar Alexander I to explore the south polar region. On January 26, 1820, Bellingshausen’s ship, the Vostok, crossed the Antarctic Circle, becoming the first to do so since Cook in 1773. Other early explorers of the region include Englishnaval captain Edward Bransfield and American seal hunter Nathaniel Palmer.